If you're curious about how to buy stocks for long-term appreciation, here's an easy method you can use to identify quality candidates. Cracking the code of how to buy stocks for long-term appreciation is more difficult than it might seem. Given the ocean of information available on the Internet, how can you identify stocks that will weather any market? One way to make the search easier is to narrow your criteria down to a few parameters. When a company shows three particular qualities at once, there's a great chance that its stock price will rise over time. These three qualities are strong cash flow from operations, revenue growth, and net income growth. Creating powerful operating cash flow is a common trait among successful publicly traded companies with long records of market-beating results. Ample cash flow quarter after quarter implies revenue and margins that can cover the costs of production or services. Excess cash flows can be used for capital expenditures (e.g., equipment, land, buildings, technology, etc. ), the paying-down or refinancing of debt, or shareholder-friendly initiatives like dividend payments and share repurchases. Rising revenue shows that a company has the ability to stay ahead of cost and labor inflation, and when it's sustained over a number of years, it indicates that an organization's products or services enjoy enduring demand. Of course, there will always be early-stage companies worth an investment even if revenue growth lies some years down the road -- in industries such as biotechnology, for example. But at some point, a promise of revenue should convert to revenue, and over time, sales must increase. While it's important to understand various measures of profit, from "gross margin" to operating income" to "earnings per share," the importance of consistently increasing net income over time cannot be overlooked. That's because net income measures profit after every conceivable expense has been considered, from the cost of goods sold to administrative expenses to taxes. Over time, a company worth your investment dollars should be able to produce measurable increases in net income. The point in taking all three indicators together is that in isolation, each can mislead you about a company's overall prospects. For example, some companies generate strong cash flow with relatively little profit or revenue growth. Others may be adept at maximizing net income but inept at making wise investment choices or handling their working capital, leading to poor cash flow. Finally, a few brave corporations opt to try to grow market share above all else, and even with handsome revenue increases and superior cash flow, profits can be scarce. 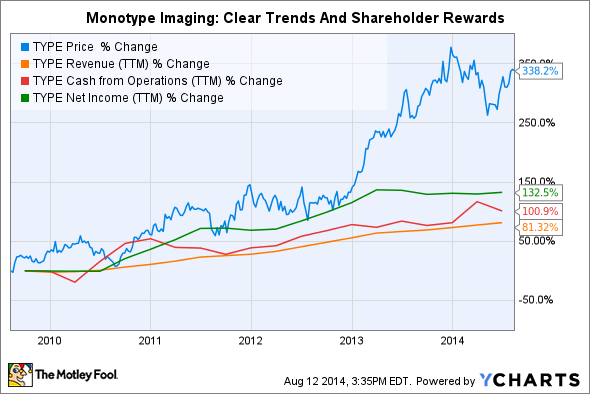 Over the last five years, Monotype's stock has shown an impressive upward trajectory. But this rise is supported by real results -- i.e., strong cash flow, growing revenue, and rising net income. Notice how the financial trend lines move in tandem. These lines together indicate that Monotype is likely a sound investment. Of course, valuation always plays a role, and a potential investor should determine whether Monotype's stock is appropriately valued relative to its earnings and future earnings prospects. And it's always a good practice to understand as much as you can about a stock and the industry in which it operates before you put your investment dollars to work. But using this troika of indicators as a fundamental piece of homework before a stock purchase may increase your chances of success. Further, revisiting these measures from time to time can also serve as an excellent way to gauge the progress of your long-term holdings.